Image uses the following options: darkened text in Precision Stamping - "Precision Round font". This medium tag measures 27mm x 15mm. The stampable area enables stamping lengthways along the tag.This tag is perfect for capturing the birth details of a child (name, DOB and weight) or any special words you would like to include. This large tag INCLUDES A 50CM BALL CHAIN. If you would like a different length or style, please choose from the options below. STAMPING: Each pair can be stamped with your choice of words, different words on each if you choose. They fit two lines of a maximum of 10 characters each. Just specify your preference in the instructions box below. Please include all your stamping requirements below. If you would like the names positioned in a certain way, please advise in your instructions. DELIVERY: Please allow a minimum of 1.5 weeks creation time + regular postage from processing your order. 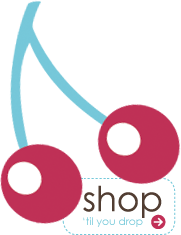 Please allow for longer turnarounds in busy periods such as Christmas and mothers day. Need it faster? We also offer a rush service (3 days turnaround + express post) for an additional fee -you can select this option below. Alternatively you can order a Gift Certificate. PLEASE NOTE: All personalised products are one-of-a-kind. Every piece made, is hand-made with love. Due to your item being stamped individually, there may be variations in each item. No two items will be identical in shape, size or texture and you will notice that the lettering isn't always perfectly straight or identically spaced, but that all adds to the charm and uniqueness of each handmade item. What makes the premium range different? All of our personalised jewellery in our premium range is made with sterling silver or 9 carat gold. There are 3 major differences between our premium jewellery and some of the other personalised jewellery on the market. Firstly, we can stamp on both sides of our jewellery pieces with precision stamping because they are not flimsy and fine. Secondly, we polish both sides of our jewellery after stamping to give it a beautiful, quality finish. There are no large imprints, scratches and dents on the back of our jewellery pieces as a result of the stamping unlike other personalised jewellery providers. We take great care to give a beautiful, quality keepsake. Finally our materials are sourced within Australia and designed and made by us in Oz. Be careful when ordering personalised jewellery elsewhere that you are not inadvertently buying overseas mass produced products. They also have fast turnaround times. What is the difference between hand stamped and precision stamped? (Please check the font options available for this piece above and in the drop down box below). Hand stamping is achieved with the use of a hammer, stamping each letter, one letter at a time. It creates impressions in the metal and gives a hand made, rustic look, it isn't always perfectly aligned. Upper or lower case is available, we use a 1.5mm font size on all our pieces for hand stamping. Precision stamping uses technology which also results in a groove/impression in the metal. With the use of technology however, it results in a slightly more symmetrical/aligned finish. It also enables us to fit a few more characters on each piece if required, and to offer various fonts and graphics. 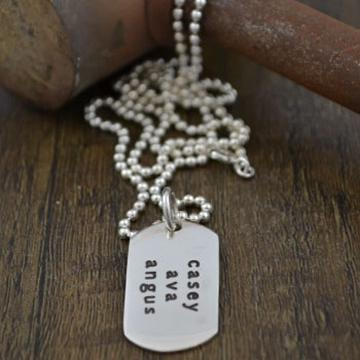 We can precision stamp or hand stamp all our name pendants, making each piece totally individual. Please note that not all the letters, spaces or numbers will be totally straight with the hand stamped jewellery. This is part of the charm of our jewellery, and the hand crafted nature of your hand stamped jewellery purchase. To darken or not to darken? You can choose to have your letters/numbers darkened or not. All of the pictures above have the letters darkened. If you look through the gallery, there are examples of both for you to see. The darkening of the letters makes the stamping stand out better, easier to read. Some people however prefer the stamping to be a little more subtle so choose to have it undarkened. Describe your exact text configuration requirements i.e. your text typed exactly as you require it to be stamped, symbols, font, charms, birthstones (as applicable)etc. Please ensure you have read the no. of characters and fonts available for this piece.